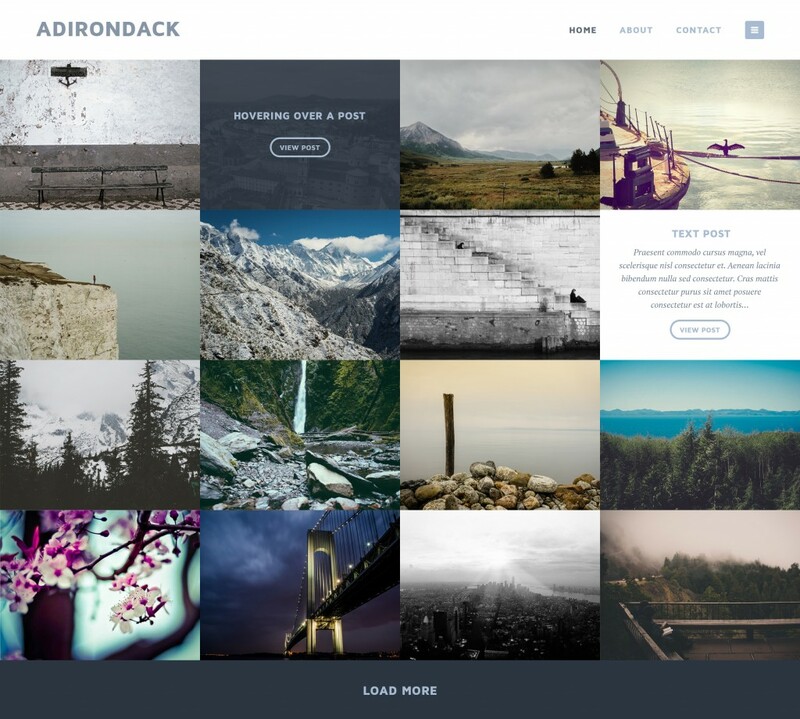 Adirondack is a big, bold photoblogging theme for people who want to showcase their photos in style. Feature one of your recent posts, or display everything evenly in a grid of photos. With long posts or short, Adirondack will let your photos shine. Adirondack lets you view and add comments at any point — just toggle comments on and off from the right side of your screen. Adirondack is crafted to look great at any screen size. Supercharge Adirondack with infinite scroll and Photon, and use Jetpack featured content to showcase your biggest, boldest image. Find out more about featured content here. You can also check out Adirondack on Github if you’d like the source files. 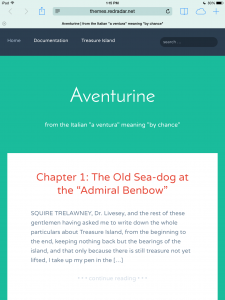 Aventurine puts the focus back on your content, with large type and bright colors. 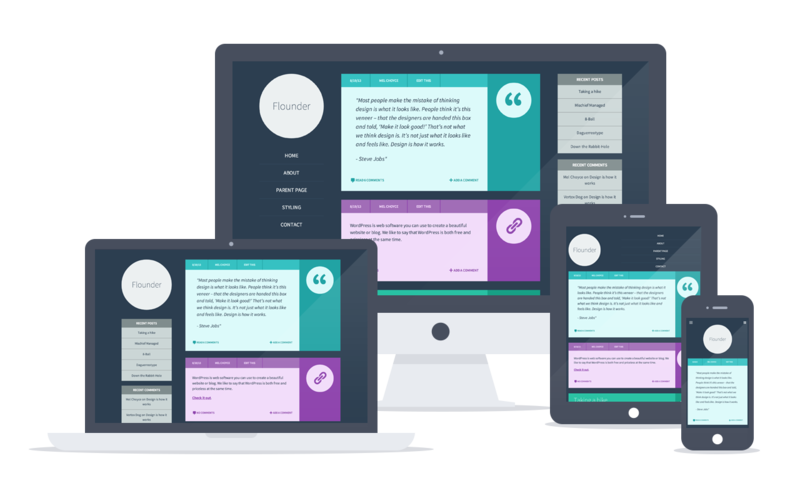 Responsive and built with accessibility in mind, your content can be easily available to your entire audience. 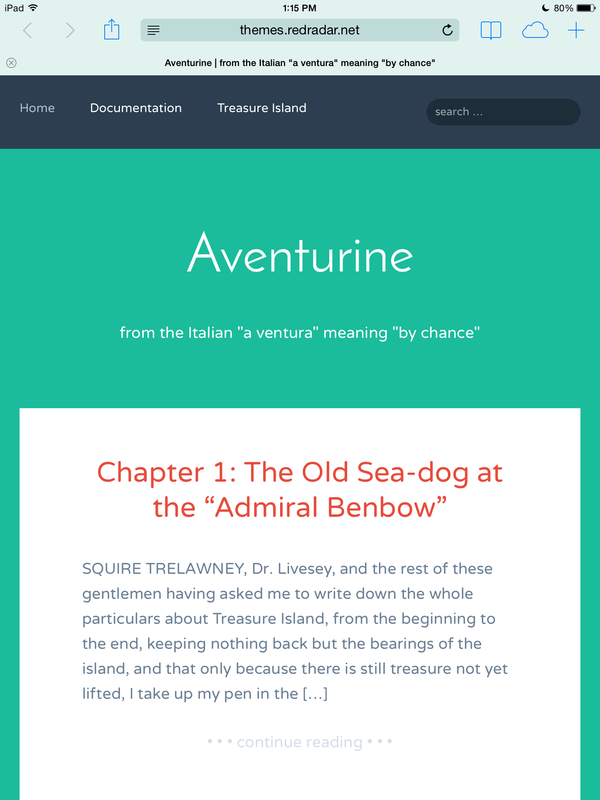 With large type and bright colors, Aventurine really puts the focus back on your content. 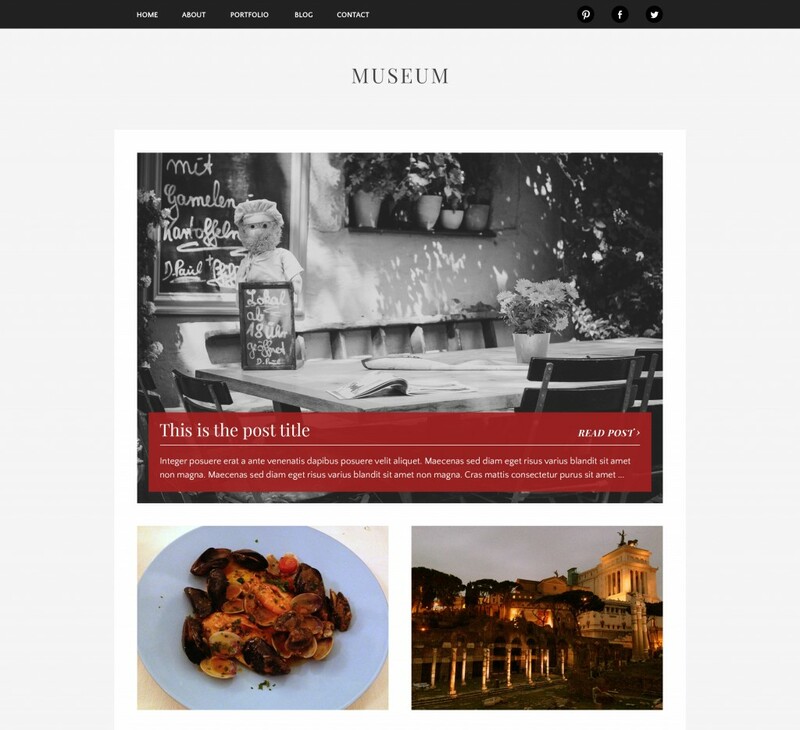 The code for this theme was written with keyboard and screen reader accessibility in mind, so your content can be easily available to your entire audience. Aventurine is crafted to look great at any screen size. 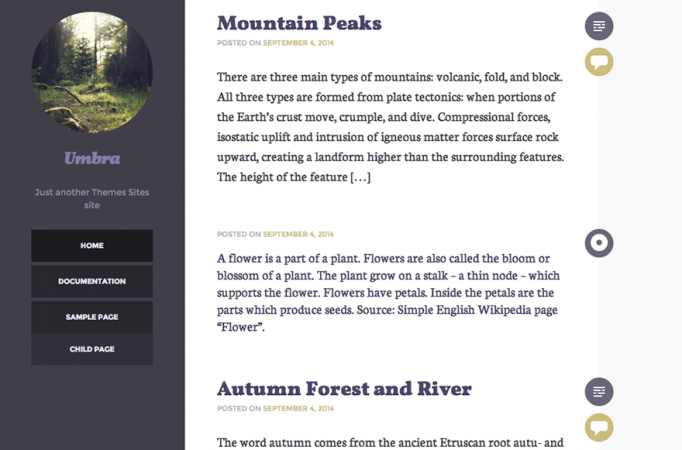 Supercharge Aventurine with Jetpack galleries, carousels, infinite scroll, and Photon. You can also check out Aventurine on Github if you’d like the source files. 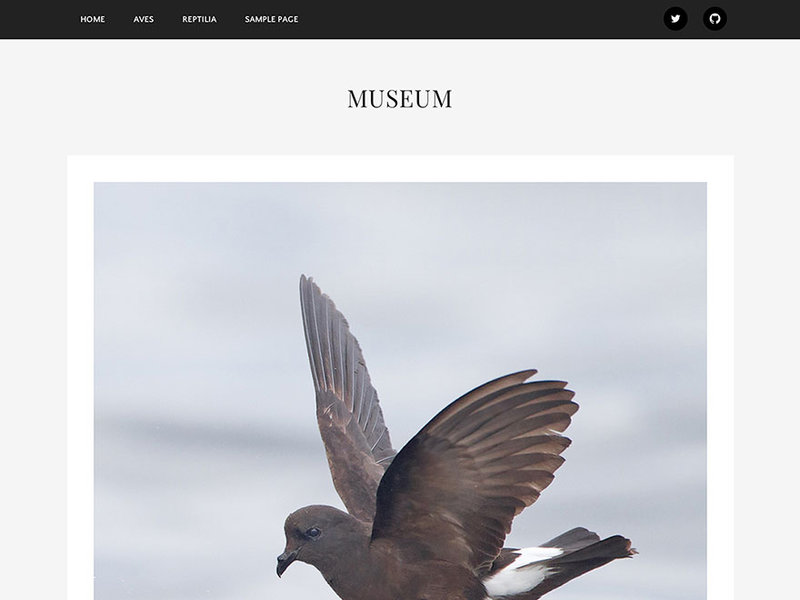 Umbra is a colorful new WordPress theme. Powered by Jetpack’s Tonesque library, Umbra derives its palette from your very own images, or from a color you pick. If you have Jetpack installed and active, the theme will pull a color from the first image it finds in your post, and use that to generate a color scheme for the page. You can also set the default scheme just by choosing a single color. 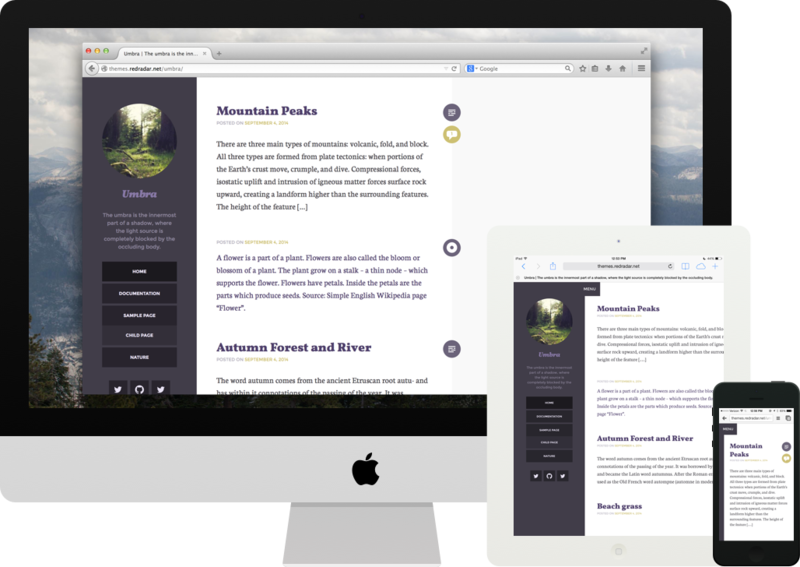 Umbra is fully responsive, working well on everything from your phone to your large monitor. Supercharge Umbra with Jetpack galleries, carousels, infinite scroll, and Photon. You can also check out Umbra on Github if you’d like the source files. 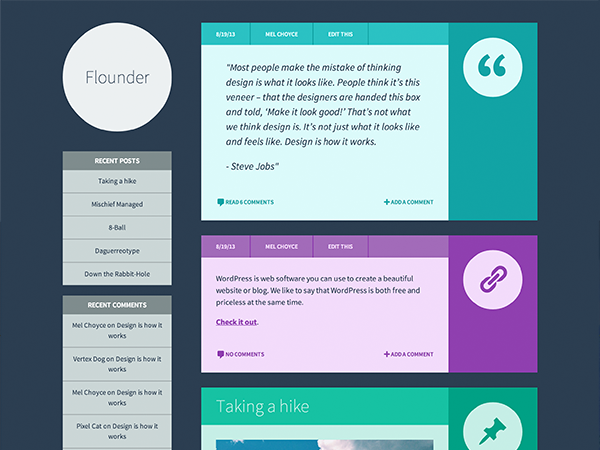 Kelly and I are very happy to announce the release of our first theme, Flounder! Flounder supports all currently available post formats, drawing on colors and iconography to set each apart. Flounder is fully responsive, working well on everything from your phone to your large monitor. Flounder is designed to work seamlessly with many of Jetpack’s popular features such as infinite scroll and enhanced gallery support. You can also check out Flounder on Github if you’d like the LESS source files. rdrdr is a collaboration between UI/UX designer Mel Choyce and developer Kelly Dwan. We’ll be using this space to announce and link to all of the various themes or collaborative projects we’ve been working on together. Our first published theme will be announced shortly!